Like many young girls, I grew up watching my own mother do her makeup. I was fascinated by the transformation she took on with her many steps, products, and how glamorous she looked when she was done! I became a ballet dancer growing up and took what I learned from my mom about how to apply my own makeup for my performances throughout my childhood and teenage years. I soon realized I enjoyed applying those dramatic makeup looks I had to wear on stage (so the audience could see my face better) almost more than the actual dancing part! On into college, I acted as the resident makeup artist for my sorority sisters and used many of them as my guinea pigs for practicing various makeup looks! I graduated with a degree in Fashion Merchandising from the University of Georgia and but knew in the back of my head that the art of doing makeup was more than just a hobby. “I believe that all women are pretty without makeup. Right out of college I started on the cosmetics floor at a Nordstrom in Atlanta in 2000. After leaving the retail world for the wholesale fashion industry, I continued to book various freelance makeup jobs and weddings on the side for extra money. 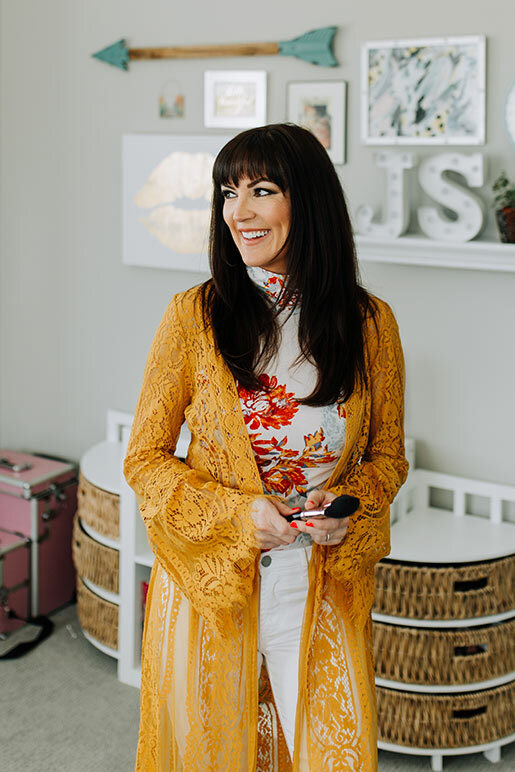 Once my husband Scott and I moved out of Atlanta and back to Athens, Ga (where we met at college) I decided to take my love of makeup artistry to the next level and start my own small business.